This category showcases our newest introductions. They are included in their respective size categories, too, but they are displayed separately here so that you can quickly check for just the newest introductions. 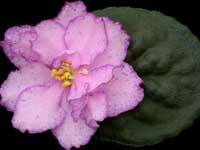 African violet leaves are packed 2 leaves per variety ordered. All listed below are standards, unless otherwise indicated. Light pink, single and semidouble stars, with a heavily fringed edge. 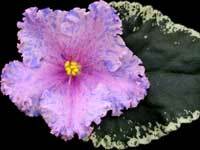 The flower eye glistens with a darker pink blush. Blue fantasy flecks lay on the flower face. 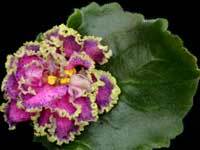 The foliage is slightly wavy, dark green and shapes easily for show. 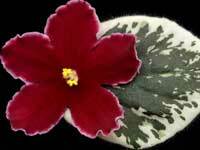 Beige variegation on the leaves, that are red backed, makes this an attractive variety, and a great bloomer! We all hope they're coming! 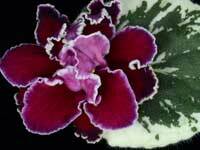 Lightly ruffled single and semidouble pansies. 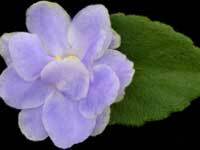 The upper petals are a slightly lighter blue than the lower ones. Occasional white fantasy puffs appear on the flower face. The foliage is dark green and serrated. Marvelous! Heavily variegated with "Champion" foliage that is serrated. Light pink double stars stand up over the foliage. 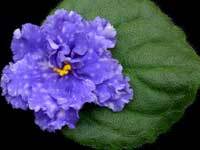 A thin, ruffled, raspberry edge surrounds each petal, that is covered with blue fantasy flecks and streaks. Wow! A hot pink center eye is surrounded by a wide purple edge boasting pink fantasy flecks. 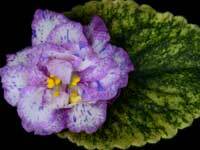 A heavily fringed green edge encompasses the flower on this semidouble to double bloomer. Wavy, medium green foliage tops off this variety. Intense! Very large, single, sticktite stars of burgundy red. A geneva edge surrounds each petal. The dark green foliage is heavily variegated. Double stars of soft blue, with a heavily frilled edge accented in white. Each petal is covered with pink fantasy puffs and streaks! The medium green foliage is serrated and quilted. Large, soft pink semidouble and double stars. 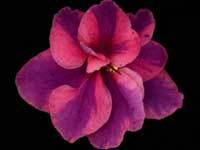 A thin magenta edge compliments the abundant magenta fantasy on this lightly frilled flower. Shiny and quilted, dark green, red reverse foliage. Violet/red semidouble stars with a lightly frilled, thin geneva edge. 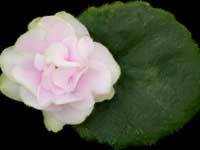 The flowers stand firmly over medium green, red backed foliage, which is quilted and variegated in beige. 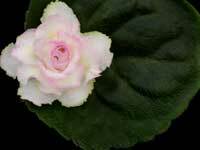 White, double rosette stars with a yellow blush in the flower eye. 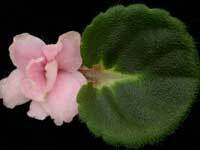 The edge of the petals are outlined in pink, with a lightly fringed green edge. The foliage is light green, quilted and serrated.